THE time for training and pruning of deciduous trees, which include peach, plum, pear, grapes, mulberry, phalsa and almond is now. The plants are sleeping" now and can be worked upon. Pruning is done to regulate crop, improve quality and contain the growth. A modified leader system of training peach, plum and pear is considered the best for this region. When a particular system is recommended , it is done keeping in mind the weather conditions prevalent  winds, and the duration and intensity of sunshine  and the texture of soil. The system, unlike its name, is very simple to follow. Keep a ship mast in mind. The procedure starts from day one. When the plant is planted, it is cut at 90 cm height and any dry wood is removed. Ground clearance is given up to 45 cm by removing any branch from the stem up to the ground level. The first branch is taken at this point. Retain branches spiralling upwards at six inches vertical distance around the main axis. This process is followed for three to four years and then the central axis is also headed at the top. The side growth on previous years branches should also be thinned to retain suitable branches. This process will give the plants a balance. Do not let two or more branches grow from the same point. Such branches not only shade each other but also break later under the weight of fruit. Any side branch growing above the central leader should be clipped. For the purpose of pruning, first remove all the dead, dried, diseased branches that strangulate that the plants. Also, remove water sprouts and suckers that grow vertically upward surpassing all the other growth. 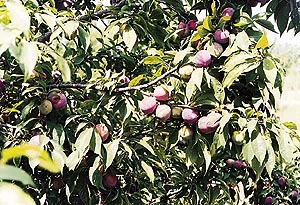 In case of peaches, the size and colour gets affected if proper pruning is not carried out. The fruit bearing in peaches is on a one-year-old growth. It is desirable to thin out by removing about 40 per cent of such twigs. Keep a distance of at least three to four inches between the bearing branches. Some heading back of old and unsuitably placed branches should also be done. Do not cut the terminals, this will encourage growing of buds immediately below the cut-end and the rest of the basal buds would remain dormant. The bearing area thus keeps going far away from the centre of the tree. Plum bears on one- year- old growth like peach, but on short spurs. Light annual pruning is done to encourage fresh growth and maintain healthy spurs, the short stout spine-like extension on branches. In pear too not much pruning is done. Only thinning out and heading back of laterals is done to encourage the formation of more number of bearing spurs. Phalsa bush should be headed back to a height of about one metre from the ground level.